Abbott Mead Vickers BBDO has picked up creative work from Samsung, the first of which is a light installation marking the launch of the Galaxy S9 and S9+. AMV BBDO will continue to support campaign development and execution for Samsung in the UK as part of the brand's agency roster. This new partnership will not have any effect on Adam & Eve DDB's work with Samsung Europe's office, said a Samsung spokesman. With regards to AMV - the activity around the launch of the new Galaxy S9 is the first project they have worked with us on. They will support campaign development and execution for Samsung in the UK as part of our agency roster. Adam & Eve work with our Samsung Europe office and our relationship with AMV does not have any impact on them or the work they do with Samsung. Titled "The Night Reimagined", the rainbow lights were projected from Potters Fields Park onto the city’s iconic Leadenhall Building (also known as the Cheese Grater) last night, and will continue for the next two nights. This project is the agency's debut work for the mobile giant and the work was awarded without a pitch. It means AMV joins Samsung's roster of agencies alongside Omnicom stablemate Adam & Eve/DDB, which opened a New York office following its capture of the US creative account in 2016. Samsung works with several agencies globally, including 72andSunny, Bartle Bogle Hegarty, BMB, Cheil, CHI & Partners, Leo Burnett and Wieden & Kennedy. Created to mark the launch of the new Galaxy S9 and S9+ the visual spectacle featured state-of-the-art reflectors and newly developed dynamic soft laser lighting. 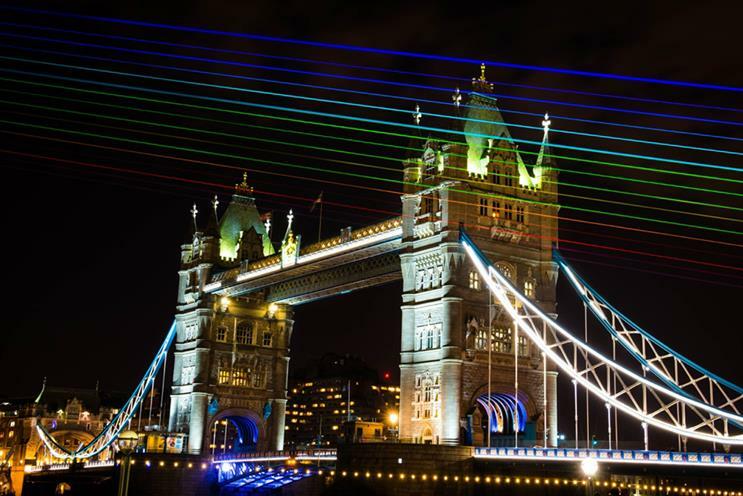 It was made with 16 state-of-the-art laser lights built in Germany and the UK, and its 10-metre diagonal array will change trajectory to twist in the sky – altering its multi-coloured perspective for viewers capturing the event with their phones. It was designed to showcase the low-light capacity of the Galaxy S9 and S9+ cameras and to tie in with Samsung's brand premise, "Do what you can't". "We wanted to give the people of London a moment not to be missed," Sam Grant, chief marketing officer, Samsung Electronics UK, said. "The installation was conceived as an amazing and almost impossible visual spectacle that represents just how Samsung is pushing the boundaries of what is possible. The beauty of the show demonstrates how the capabilities of the Galaxy S9 camera ensures people can capture epic pictures, particularly in the dark."